A friend of mine gave me this recipe years ago. 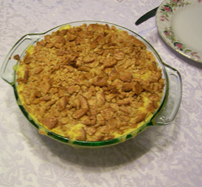 This casserole is simple to put together and has a wonderful flavor. I get asked for the recipe every time I serve this dish so I decided it was time to put the recipe up for all to see. Cook rice according to package directions: Pour rice into 2 quart casserole dish that has been sprayed with cooking spray. Add the rest of the ingredients and stir to combine. Top with bread crumbs or cracker crumbs and drizzle with butter. Bake in a 350 degree oven for 25-30 min or until heated through. This is totally addicting and a wonderful recipe. It calls from the refrigerator to heat more up and enjoy if there is any left after you enjoy it the first time. Delicious!